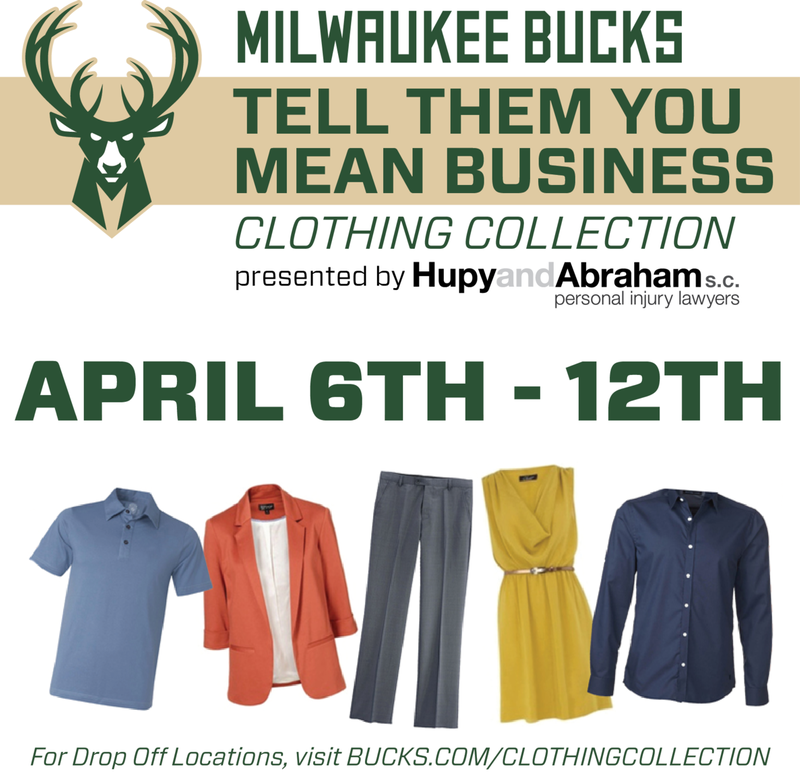 TELL THEM YOU MEAN BUSINESS Clothing Drive | Hupy and Abraham, S.C.
Hupy and Abraham and the Milwaukee Bucks have teamed up to help make sure members of the Milwaukee community have access to the attire they need to show employers that They Mean Business! From April 6-12, Hupy and Abraham, in conjunction with the Milwaukee Bucks, will be collecting clean, gently used or new business clothing and accessories for men and women to be donated to Bottomless Closet, a Milwaukee Women’s Center program that works to provide work-appropriate clothes and supportive services to men and women who are looking to enter or re-enter the workforce. Bottomless Closet is in need of petite, regular and plus-sized male and female business casual clothing, men’s and women’s steel-toed shoes, men’s and women’s socks and new pantyhose in all sizes. To get things started, the public was invited to a clothing collection kickoff party on Wednesday, April 6, at Schlitz Park. Guests enjoyed food and drink specials, as well as entertainment and games provided by the Milwaukee Bucks. The first 150 people to donate at the kickoff party also received a pair of tickets to the April 13 Bucks game against the Indiana Pacers. At the kickoff event alone we collected 1,024 pieces of clothing, with even more expected to come from the additional drop off locations!